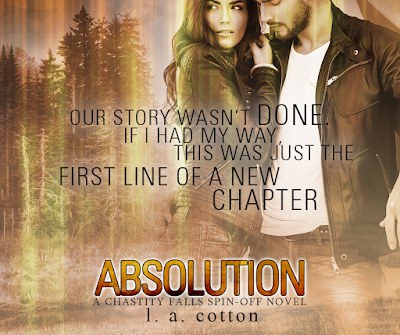 The final book from the Chastity Falls world is LIVE! Itâs supposed to be a job like any other. Get in. Do the deal. Get out. But when Dennis Hayes spots her across the room, heâs sure he must be seeing things. It canât be Cassie Malson, the only girl he ever loved. Still loves. Because four years ago he left her to live her dreamsâwithout him. He doesnât want to open old wounds, but Dennis canât walk away again. He wonât. Not until he finds out the reason for the haunted look in her eyes. Even if she hates him. Even if the truth hurts him more than he ever anticipated. Even if it means going against everything heâs ever known. Because Cassie Malson is his absolution, and this time heâs determined to save her heart â¦ even if he risks losing his own in the process.